1. USD(I). The USD(I) shall provide a quarterly report to the congressional intelligence, appropriations, and armed services committees, including the information required by section 8062 of Public Law 112-10 (Reference (m)); DoD oversight and senior Executive Branch officials; and designated leaders of the Intelligence Community. This report is commonly referred to as the “Clandestine Quarterly Activities Report” (CQ) and is comprised of information from DoD Components regarding intelligence and intelligence-related sensitive activities conducted during the previous fiscal quarter. a. Develop and coordinate policy and oversee policy implementation for DoD intelligence and intelligence-related sensitive activities in accordance with References (a), (b), (c), and this Instruction. b. Coordinate with the Assistant Secretary of Defense for Special Operations and Low Intensity Conflict and Interdependent Capabilities (ASD(SO/LIC&IC)) for sensitive special operations CQ submissions and other staff actions related to intelligence and intelligence-related sensitive activities. c. Coordinate with the Joint Staff Deputy Director for Special Operations and Counterterrorism (J37) for staff actions related to intelligence and intelligence-related sensitive activities. d. Review and edit CQ submissions, to include the counterintelligence (CI) and human intelligence (HUMINT) CQ submissions from the Defense CI and HUMINT Center (DCHC); compile and distribute the CQ to meet congressional and DoD requirements. e. Assess the effectiveness of activities in the CQ and provide recommendations to senior leaders. f. Monitor all ongoing and planned DoD intelligence and intelligence-related sensitive activities. 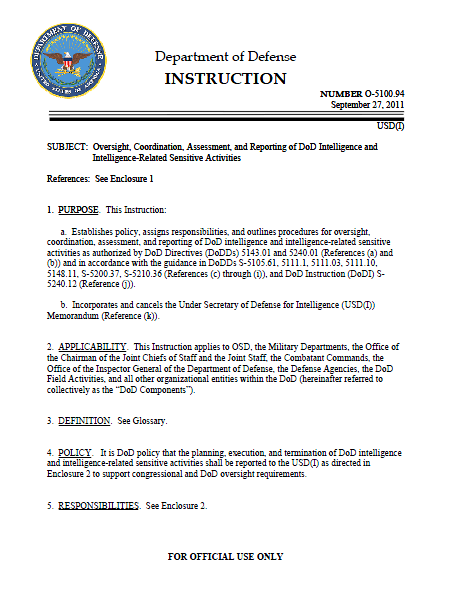 g. Conduct oversight reviews of DoD cover programs in accordance with Reference (c) and participate in oversight reviews of other DoD intelligence and intelligence-related sensitive activities. h. Establish procedures to fulfill the duties and responsibilities outlined in this Instruction that facilitate reviews across classification compartments. i. Develop and maintain the automated architecture and processes to archive, rapidly retrieve, and coordinate information related to DoD intelligence and intelligence-related sensitive activities. j. Develop and coordinate agreements with other U.S. Government agencies to facilitate DoD intelligence and intelligence-related sensitive activities. k. Implement procedures to allow Office of the Under Secretary of Defense for Intelligence (OUSD(I)) functional directorates to review and comment on CQ submissions as part of the editing process. a. Compile and review DoD Component CI and HUMINT CQ submissions. b. Forward a consolidated CQ submission for the preceding fiscal quarter simultaneously to the OUSD(I) Sensitive Activities Directorate and the OUSD(I) HUMINT and CI Directorate not later than February 8, May 8, August 8, and November 8, respectively. Submit reports in the format outlined in the appendix to this enclosure. 4. ASD(SO/LIC&IC). The ASD(SO/LIC&IC), under the authority, direction, and control of the Under Secretary of Defense for Policy, shall prepare and submit a report summarizing DoD theater special operations forces sensitive activities for the preceding fiscal quarter to the OUSD(I) Sensitive Activities Directorate not later than January 18, April 18, July 18, and October 18, respectively. Submit reports in the format outlined in the appendix to this enclosure. 5. ASSISTANT TO THE SECRETARY OF DEFENSE FOR INTELLIGENCE OVERSIGHT (ATSD(IO)). The ATSD(IO) shall exercise oversight responsibilities for intelligence and intelligence-related sensitive activities in accordance with References (g), (i), and (j). a. Report DoD intelligence and intelligence-related sensitive activities, other than CI and HUMINT activities, for the preceding fiscal quarter to the OUSD(I) Sensitive Activities Directorate not later than January 18, April 18, July 18, and October 18, respectively. Submit reports in the format outlined in the appendix to this enclosure. b. Report CI and HUMINT CQ activities to the Director, DCHC, in accordance with Reference (c) and DoD Instructions S-5240.09 and S-5200.42 (References (n) and (o)). Submit reports to the Director, DCHC, in the format outlined in the appendix to this enclosure not later than January 18, April 18, July 18, and October 18, respectively. c. Report significant changes that may emerge in the interval between CQ reports simultaneously to the DCHC and the OUSD(I) Sensitive Activities Directorate as soon as they are identified.